There is plenty to do while you are staying at our exclusive Maine lake cabin rentals. Our facilities include a main lodge which has a dining room, sitting room with VCR and movies (Note, we do not have TV), and a sitting room with a library. 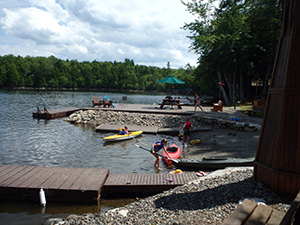 We have a large dock area and swimming area. Also we have a new recreation hall which has a pool table, ping-pong table, card playing area, sitting area and toy area for small children. Also we have a bonfire pit. Calais (22 miles) has a small movie theater, restaurants, supermarkets, stores, antique shops, Downeast Heritage Center and St. Croix Island. Day trips include whale watching out of Eastport, a visit to Quoddy Head State Park and historic West Quoddy Light house or the Roosevelt Homestead on Campobello Island. 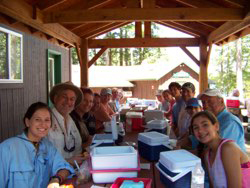 A great feature of Long Lake Camps, being discovered by companies and families, is our capability to accommodate large groups. We can easily house 40-50 people at a time with lodging, meals, and boat rentals. We have many guides that can be provided, if desired, to make your stay that much more enjoyable. If our guests decide that they don't want the meal plan, and wish to cook for themselves, all of our cabins have fully equipped kitchens. 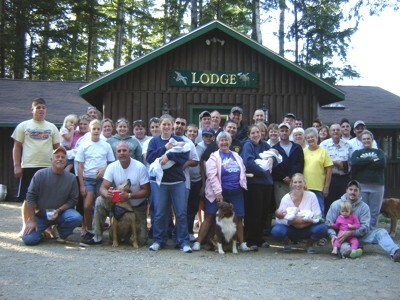 Our campground provides a great amount of space for family or group activities. Our new "guest laundry" facility can provide a much needed service for those longer stays. Whether it's a trip to provide some down time for business executives or some real family fun, we promise to try our best to accommodate your personal and/or group needs. Contact Amanda for more details on pricing and scheduling for these accommodations.